Delivered Cheyenne 23/1/43; Gt Falls 31/1/43; Salina 3/2/43; Nashville 23/2/43; Assigned 364BS/305BG [WF-G] Chelveston VANISHING VIRGIN 24/3/43; transferred 546BS/384BG [BK-F] Grafton Underwood 30/9/43; 1 Base Air Depot, Burtonwood 15/3/44; Returned to the USA 12/5/44; Lockbourn 3/8/44; Reconstruction Finance Corporation (sold for scrap metal in USA) Walnut Ridge 18/12/45. X-VIRGIN. Ursprünglich der 305. Bombergruppe zugewiesen. Die B-17 #42-29636 trug den Namen The Vanishing Virginian. Ihr Original-Navigator, Mal Sweet, schlug vor sie in The Virgin umzubenennen. Durch einen Flaktreffer über dem „V“ am 14. Mai 1943, kam es zu einer Namensänderung. Entjungferte das Flugzeug und bevollmächtigte sie den Spitznamen X-Virgin zu tragen. Captain David Tyler brachte sie zurück vom Schweinfurt-Einsatz am 17. August 1943 und machte eine Bauchlandung. Die B-17 wurde dann der 384. Bombergruppe transferiert. Die X-Virgin überlebte Ihre Pflichteinätze und kehrte am 12. Mai 1944 in die USA zurück. Besatzung beim Schweinfurt-Einsatz siehe unten. I spoke with David Tyler about 20 years ago after I found a letter he sent to the crew chief thanking him for keeping the plane operating. He told me that when the plane was flown the England by the original crew it had the name The Vanishing Virginian. Once the plane was in England it was transferred to a different crew with David Tyler as the pilot. 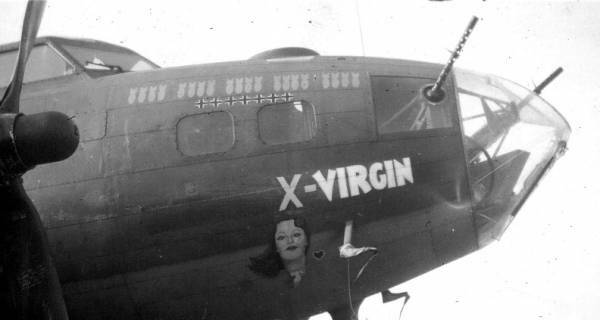 Since no one in the crew had any attachment to the original name they painted over the letters to make it The Virgin. It became x-virgin when it suffered bad damage and had to be repaired over a number of days while the crew flew a different plane. When they got the virgin back they decided it was not a virgin any more and added the x. 364th squadron of the 305th bg. He said they finished their tour a few weeks after the Memphis belle. Mr. Tyler had sent me a xerox copy of his flight log as well as a photocopy of his private photo album. He took a picture of the crew after each mission. His last mission was in fact the Schweinfurt mission. So about 3 months after the Memphis Belle. They only returned with half of the crew as the plane was badly damaged, 4 members parachuted out and one was killed during the mission. He was an amazing man to talk with. Do you have the crew list of the last mission? Yes I do if I can make out all of the names. In the scrapbook he lists Larry Singleton and Bob Van Rees as waist gunners but they must not have been on the last mission. I hope that helps and that it makes sense.